Turbochargers are fitted to engines, two or four stroke, to improve performance. Without a functioning turbocharger, an engine loses more than 50% of its performance. A well functioning Turbocharger is thus essential to ensure you have sufficient power when required. 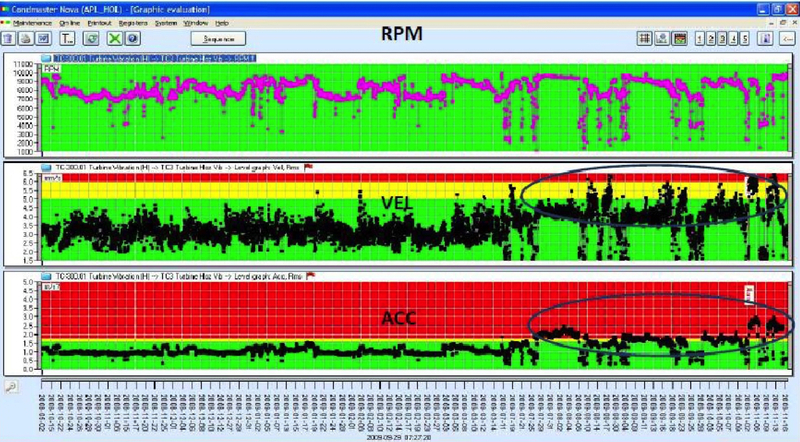 Below is a screen capture of the Turbocharger setup in the Condition Monitoring software. Each Turbocharger is fitted with horizontal and axial vibration transducers on the Turbine side and one horizontally mounted vibration transducer on the Blower side. 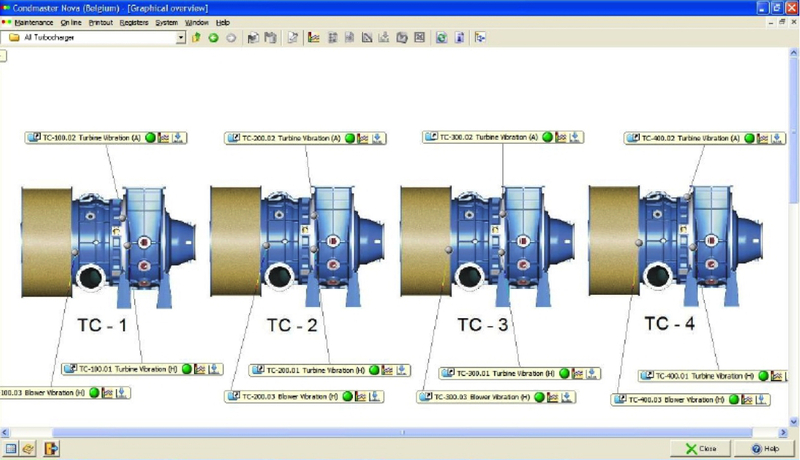 The green dots indicate satisfactory operating condition of the turbocharger. Below are the trends graphs spanning from mid-2008 to November 2009. The Turbocharger rotational speed is indicated at the top (only measured when the turbo speed is above 7000 rpm) and below that the overall velocity and acceleration RMS values of the Turbine. The velocity values starting to get erratic from about July 2009 and the Acceleration values entered the alarm zone (red) at the end of July. 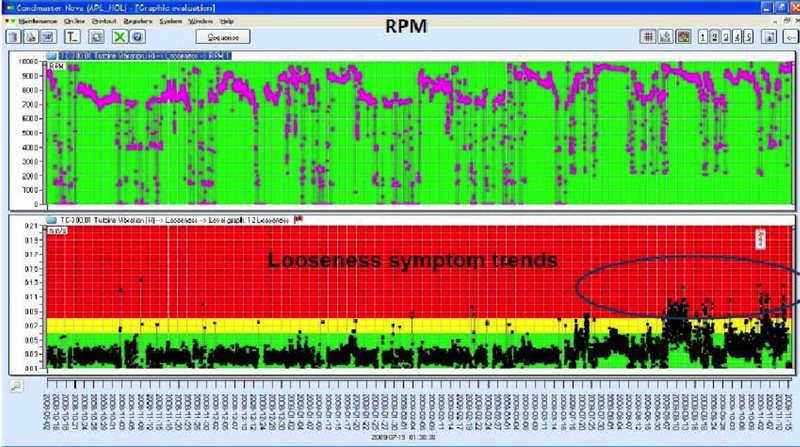 In the next graph, the vibration Looseness Symptom is trended. This triggered the alarm and started exceeding the alarm level consistently from September 2009. 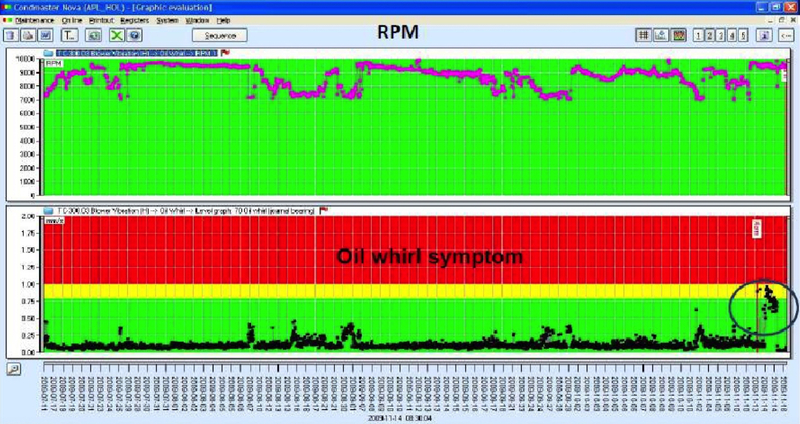 From the above case it is clear that the system was able to detect the development of a problem 4 months in advance, providing an initial alarm, followed by a 2nd alarm triggered on the Looseness symptom 2 months in advance and finally the Oil Whirl Symptom Alarm 2 days prior to the eventual failure. The above system triggered the alarms without any response from the crew, eventually leading to a preventable catastrophic failure.